When it comes to understanding the legal nuances and differences between legal separation and divorce, it can be challenging to say the least. In our last article, we discussed some of the differences between these two legal filings, as well as some reasons why legal separation might make sense. Today we will take a look at some of the questions our clients frequently have about legal separations. Dorris Law Group understands that each situation is unique, and we’d welcome the opportunity to speak with you about yours. Get in touch with one of our expert legal separation attorneys today. Who Can File for Legal Separation? Either spouse can file for a legal separation, but both spouses must be in agreeance to the separation before the separation will be granted. This is in accordance with Arizona Revised Statutes (A.R.S.) 25-313. Can We File for Legal Separation if We Just Moved Here? The residency requirements state that either spouse must have lived in the state of Arizona for 90 days before filing for separation. If there are children involved, the children must have lived in the state of Arizona for the six months preceding the filing. Do I Need an Attorney to File for Legal Separation? You can petition the court on your own, or you may have an attorney do so on your behalf. Every marriage and situation is different and some separation agreements are more complex to negotiate than others. We recommend consulting with a legal expert to understand how your specific situation may be impacted by a legal separation. Regardless of whether the couple is separating or divorcing, child visitation and custody are handled very similarly in the state of Arizona. If you and your spouse have come to an agreement on child custody and visitation, these will be detailed in the petition filed. 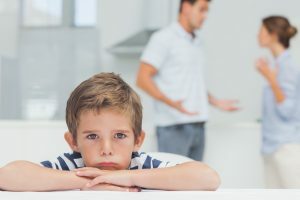 If the legal separation is not amicable, legal experts and the courts will work on behalf of the couple to determine appropriate custody and visitation terms for each parent. How are Debts and Assets Handled? Much like child custody and visitation, couples are required to specify their assets and debts on the petition for legal separation. Couples must determine if one or both spouses will be responsible for the debts, assets, and/or properties. The separation decree will state how these items are divided. We understand that you’re likely to have more questions beyond these basic inquiries. While this article is meant to be informative, it should not be construed as legal advice. If you’re considering filing for a legal separation, we recommend consulting with one of the experienced attorneys at Dorris Law Group. We are well-versed in the A.R.S. that govern legal separation and divorce, and can give you the legal guidance and advice needed for such an important decision. Call us at 520-622-4866 today or fill out the form below.